We love seeing new Playtech slot games, which is why we were delighted to see the release of the Wacky Waters slot. 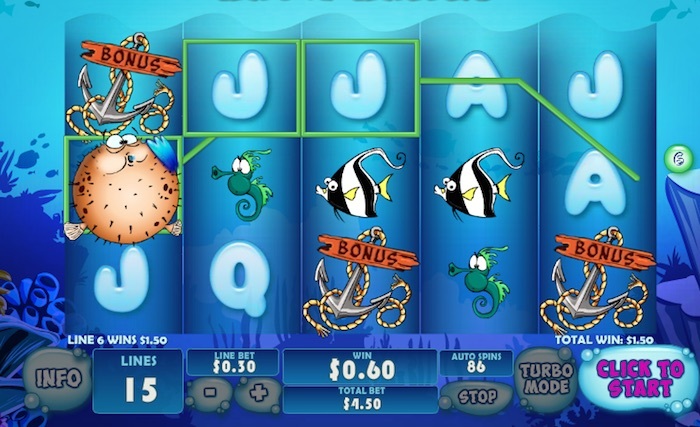 This game takes us into the deep blue sea, but while you’ve no doubt seen online slots with a similar theme before, this one shoehorns in lots of exciting features. The Wacky Waters slot is a 5 x 3 online slot game from Playtech, which immediately makes it one to look at. The game uses several shades of blue to illustrate the underwater setting, and you’ll meet plenty of inhabitants of the deep as you play. The main feature here is the presence of lots of bonus features – and we mean lots. Let’s dive into the deep to see exactly what awaits you when you try the Wacky Waters online slot game for size. The graphics are not that detailed here, but it works. The creatures of the deep are all designed as cartoon characters, so there’s no need for stunning accuracy. Whoever saw a grinning shark that looks as happy as the one in this game does? All your controls are laid out under the reels. You must play all the lines so that part is taken care of, but you can use the plus and minus keys to move up and down through the bet values. You can also activate the autoplay or turbo mode options. The info bubble to the left of the controls reveals the paytable when you click on it. Over the course of six pages, you’ll learn all there is to know about the game’s special features. While it does use the normal A, K, Q, J, 10 and 9 symbols, the game also features a clown fish, a shark, an octopus and a starfish among other residents. The puffer fish is the biggest payer by far. The scatter for Playtech’s Wacky Waters is a shell with two eyes peering out. Three of these (or more) appearing anywhere triggers the Cash Crab feature. You get to pick one, two or three shells, determined by whether you got three, four or five shells to trigger the feature. Each one hides a prize, and the special crab hides a prize of 100x your bet. The puffer fish, meanwhile, is the wild. He will substitute for everything that appears in the slot apart from the shell scatter and the bonus anchor. If he appears on the second position on the third reel, the Puffin’ Up feature will trigger. When this happens, Albert (yep, that’s his name) puffs up until he pops. Don’t worry, though, because as he deflates back to his normal size, he’ll leave up to six other puffer fish on the reels in addition to him. That means you could have up to seven wilds on the reels to trigger multiple potential prizes. So, what about that bonus symbol? Well, the anchor has some rope coiled around it and it has the word bonus helpfully written on a piece of rotted wood too. If you should find this bonus symbol on the first, third and fifth reels simultaneously, you will be able to access Albert’s Underwater Bonus feature. Albert the puffer fish is stuck on an anchor. Your job is to help him free himself. Choose which path you think he should use to escape. Once he starts swimming, he could collect multipliers, free games, extra wilds and extra air for him so he can swim for longer. All these elements will then be used in the free games that will follow (yes, you have those to look forward to as well). If you should find Albert in the centre of the third reel during the free games, you will win a further three free games. If the bonus symbol should appear on all the odd-numbered reels again, you get another eight free games, but you won’t play the underwater bonus first. The games are added to your current total and played through until the end, at which point you go back to the main game. We think the Wacky Waters Playtech slot delivers betting options every player will be pleased with. A penny bet per line is possible, giving a 15p minimum bet amount (you must play all the lines here). But it’s also possible to bet a whopping £1,125 per spin with £75 on each payline. 3,000 coins can be won by lining up five friendly puffer fish on a line. Mind you, there are possibilities to win plenty more than that in one of the bonus features if the luck tips in your favour. We were pleased to see a decent return-to-player percentage too, coming in at 95.58% over an extended playing period. With so many UK online slots to choose from, any new release must be good if it wants to stick around. 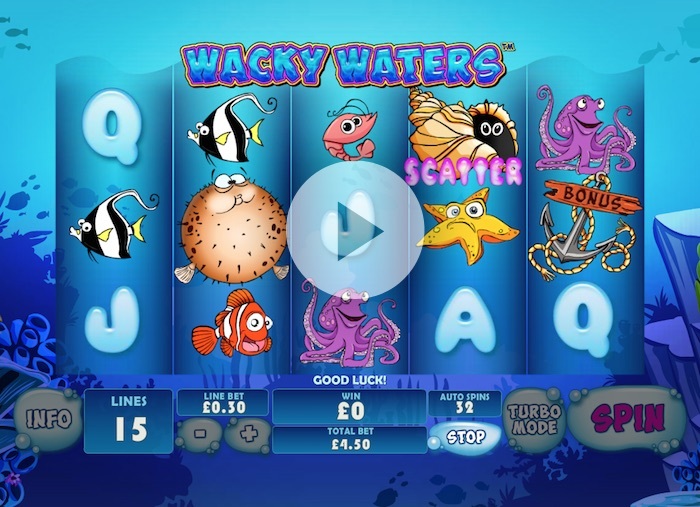 In our opinion, the Wacky Waters slot delivers on its promise in a big, big way. This is a game we could happily play for an extended period. It’s a pleasure to play, and there are so many bonus features, you’ll want to try them all.